Type and Use: Half-hardy biennial, grown as an annual with edible flower clusters and leaves. Broccoli is a cool-season vegetable for use in the spring and fall. Planting Dates: For the spring garden, plant seed weeks before last average frost. Start indoors or in a cold frame around mid- January during the waxing moon cycle. Plant transplants in early spring. Broccoli can tolerate and actually likes light frost. For the fall garden, plant 10-12 weeks before first frost. In general, mark your calendar for February 1 - March 15 and August 1 - August 31. Planting Method: Plant ¼-½ inch deep. Press surface lightly but firmly with a board or flat trowel. When the fifth leaf emerges, transplant seedlings to 4 inch pots to hold until planted in the garden. Seed Emergence: Germination in 3-10 days at 68-86°. Harvest Time: 50-80 days from transplants. Harvest heads when they are about two-thirds of their potential size. Cut above side buds, which will continue to mature into heads that can be harvested later. Final Spacing: 12-24 inches although 15 inches is considered to be the ideal spacing. Growth Habits: Leafy vegetable with large flower heads. Both are edible. Culture: Cool-weather vegetable that likes healthy well-drained soil, full sun. Continue fertilizing after the first harvest to encourage the secondary heads. Broccoli likes moisture and plenty of fertilizer. 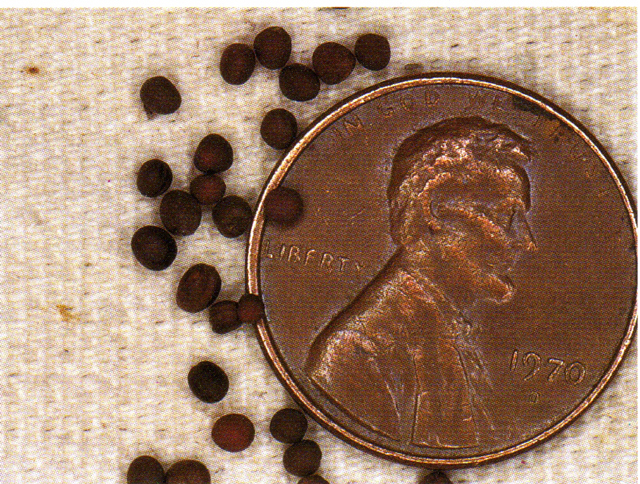 Fertilize when the heads begin to form and are about the size of a fifty-cent piece. Sprinkle a half handful of organic fertilizer around each plant. Troubles and Solutions: Aphids, harlequin bugs, cutworms, green worms, flea beetles, loopers, and boron deficiency. Use Bt products for the loopers, cutworms, and other caterpillars. Spray molasses, manure compost tea and citrus oil for the other critters if needed. Healthy soil and beneficial insects will prevent most pests. Harvest and Storage: Harvest flower heads when they are large but still firm. When the yellow flowers start to open, they get tough. Eat right away or store in the refrigerator at 32-40° for 1-2 weeks. Notes: Broccoli is nutritious and considered an important health food. President George Bush doesn’t eat it, but he should. Always use healthy, vigorous plants. Avoid those with tough, woody stems. Set transplants just below the first set of leaves. According to researchers at Johns Hopkins University, broccoli sprouts have up to 50 times more powerful anticancer chemicals than mature broccoli. Varieties: Packman, Galaxy, Green Comet, Heirloom, Calabrese, Early Green, Purple Sprouting, and Waltham.